Both governments and embassies have approached Germany for many years because of international family and child conflicts. Now the European parliament will deal with such questions. Especially foreign parents have had dramatic conflicts with German Jugendamt and courts. Foreigners report report to be shocked meeting German administration and courts e. g. not having even heard when decisions were made and of many other forms of unfair treatment. 5 German states are the last states in the civilized world to deny freedom of information i. e. the "Right to Know" or access to public information. While Germans have been subject to these denials for ages (Appendix D, E), foreigners are used to these civil rights and do not accept human right violations. German judiciary lacks independence (Art. 6 European Convention on Human Rights and Fundamental Freedoms) to protect citizens rights and human rights against the "Jugendamt" and other authorities. Judges in federal states are hired, promoted and supervised by the governments. Independence of the justice system is considered basic for a democracy and regulated with international law (Appendix C, D). In direct contact with administration the right to good administration according to Recommendation 1615 (2003) of the Parliamentarian Assembly of the Council of Europe and CoE Recommendation Rec(2007)7 on good administration and Charter of Fundamental Rights of the European Union in EU is missing in Germany, i. e.
According to CoE RECOMMENDATION No. R (85) 13 an independent Ombudsman for public administration should be empowered "to investigate and give opinions when human rights are involved". Germany is the only country in Europe which "reserved the right to comply with it or not" (Appendix E). The Parliamentary Assembly confirms in in Recommendation 1615 (2003) the importance of the institution of ombudsman within national systems for the protection of human rights and the promotion of the rule of law, and of its role in ensuring the proper behaviour of public administration (Appendix F). Administration and Jugendamt are not subject to investigations and control of an independent ombudsman. German authorities claim that courts guarantee the rights of citizens. However most victims do not risk to go to court, because of costs. But German judiciary lacks independence according to Art. 6 European Convention on Human Rights and Fundamental Freedoms (ECHRFF)) to protect citizens rights and human rights against the "Jugendamt" and other authorities. Judges in federal states are hired, promoted and supervised by the governments. When administrative courts were founded, there was no supervision of judges, because it would have been a disadvantage for citizens who complain against the administration lead by the government. However the dictator Hitler added supervision of courts. Before the Prussian administrative courts (Preußischen Oberverwaltungsgericht) have been without supervision since 1875, as well as e. g. administrative courts in Saxony. But § 7 sentence 1 of the first regulation ("Durchführungsverordnung) of 29. April 1941 of the decree of the fuehrer ("Führer-Erlass") on the establishment of the administrative court of the Reich (Imperial Law Gazette RGBl I S. 201: Erste DV = RGBl I S. 224) gave the minister of justice of the Reich supervision rights. Today a majority of both law scientists, lawyers and politicians defend this invention of the dictator Hitler of supervision of judges. 1939 the organisation of the Jugendamt was changed. The Mayor became the head of the Jugendamt, which was not changed after the war. Administrative complains ("Dienstaufsichtsbeschwerde") against the Jugendamt do not give the right to a that an answer within reasonable time giving reason. Unfortunately the German press does not inform the public about human right violations and lack of independence of judges, but gives the impression that Germany has the best justice system in the world. Three dozen petitions to German parliaments to abandon rules from the Third Reich in favour of international law did not help. Unfortunately the German press does not inform the public about human right violations and lack of independence of judges, but gives the impression that Germany has the best justice system in the world. Therefore politicians preferring "Third Reich" rules over international law still get elected. More then 125 states with more then 5.9 billion inhabitants adopted FOI laws or provisions in constitutions (http://right2info.org/laws). 5 German states with half of the population lack FOI laws. 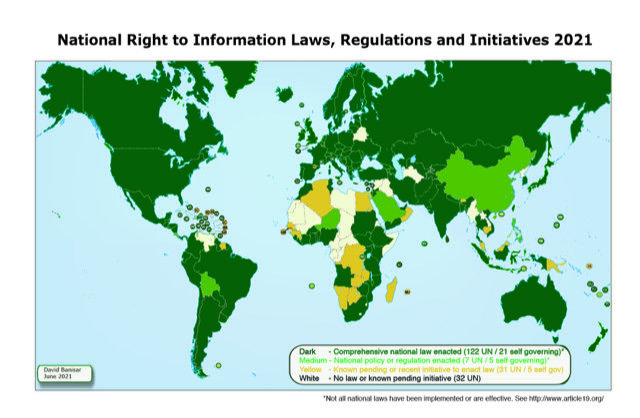 88 states with 5.5 billion inhabitants give better access to information then the federal Freedom of Information Law in Germany (http://www.rti-rating.org/country-data/). The UN Convention against Corruption is ratified by 160 states with more then 6.5 billion inhabitants, but not by Germany. Germany did not ratify the Criminal Law Convention on Corruption and does not follow Recommendation Rec(2003)4 on common rules against corruption in the funding of political parties and electoral campaigns of the Council of Europe. 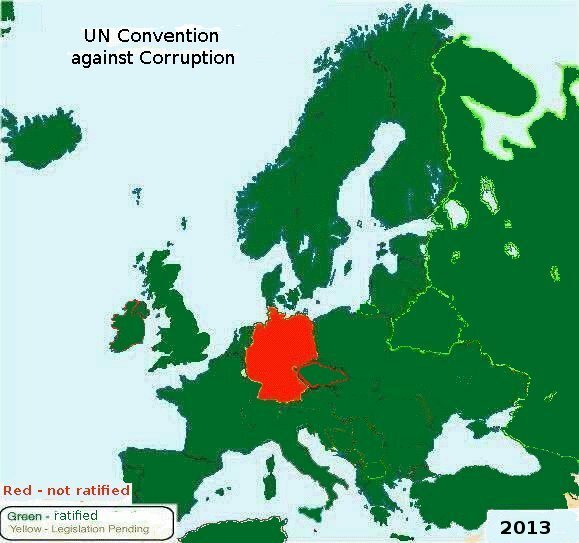 Germany is the only state in Europe which has not ratified any of these to conventions against corruption. This rejection of the human right of access to information and transparency in Germany is outstanding in EU, Europe and the civilized world. Therefore the European Court of Human Rights (ECtHR) is important. In Article 8 of the ECHRFF family rights are protected. Article 10 ECHRFF secures Freedom of Information. However the ECtHR has an overload of cases and demands that all domestic remedies must be tried first. i. e. national courts up to the highest level. The costs of domestic remedies are high, because a lawyer has to be hired for higher courts. The Human Rights Commissioner of the Council of Europe visited Germany and published the report CommDH(2007)14 with many suggestions, i. e. promote independent extrajudicial complaints bodies and educate judges and administration in human rights (Appendix H). However the national parliament Bundestag rejected even to discuss (Appendix L) these suggestions and petitions to 11 local parliaments where rejected (Appendix I). "The Union is founded on the values of respect for human dignity, freedom, democracy, equality, the rule of law and respect for human rights, including the rights of persons belonging to minorities." Human right of access to public documents (information) is still lacking in 5 of 16 states (länder) (see Appendix G), which is found all over Europe and the civilized word. Decriminalisation of punishment of defamation (insult, libel) according to OSCE (Appendix N, O, P). Up to now 180 000 accused i. e. 20 % of criminal prosecution cases are insult (Appendix Q). Even sending copies of petitions about decriminalization of defamation and suggestions of the Human Rights Commissioner CommDH(2007)14 was answered by a threat of insult accusation (Appendix R and S). 25. April 2013 the human rights situation of Germany was reviewed by the Human Rights Committee. 96 states gave their comments and made approx. 200 recommendations e. g. about the Jugendamt. "31. Poland requested to know about its recommendation made at the first review regarding judicial control over the administrative decisions of the Jugendamt and about measures taken to meet the international obligations arising from article 17 of ICCPR. Poland made a recommendation. 59. Turkey noted insecurity caused by growing xenophobia and the killing of 10 persons by the National Socialist Underground. It noted the separation of Turkish children from their families by the Jugendamt and criticism of that body’s actions. Turkey made recommendations. 115. Italy requested Germany to elaborate on the specific measures it intended to take for migrant children to overcome possible obstacles encountered in accessing higher education. It referred to concerns about the work of the Jugendamt." 28. April 2013: Many delegations of the Human Rights Council complaint about the Youth Office (Jugendamt) during the Universal Periodic Review. Petition to EU Parliament (9. February 2012): Jugendamt, Human Right of Access to Documents of Public Administration and Good Administration. 20. November 2008: MEP Boguslaw Rogalski "Written declaration on discrimination on grounds of origin"
26. November 2007: European Parliament: President of the Conference of INGOs of the Council of Europe demands to abolish the Jugendamt: Video. 14. November 2007: Letter to German Chancellor about Human Right Violations: (Menschenrechtsverletzungen). 2. November 2007: President of the Conference of INGOs of the Council of Europe sends Bamberg declaration on human right violations to Commissioner for Human Rights Council of Europe and Chairman of the Committee on Petitions European Parliament (Att.“Bamberg Declaration”). 26. October 2007: The general information contained in your communication, including suggestion of legal reforms, was read with attention and may be used by the Commissioner in the exercise of his mandate. 21. October 2007: “Bamberg Declaration”: Within the framework of the child and youth protection in Germany, especially on the part of the youth welfare offices, there are violations of Human Rights, in particular of Article 3, Article 6, Article 8, Article 13 and Article 14 of the European Convention of Human Rights. Parents are using the Internet to inform. 21. October 2007: GERMAN Jugendamt (falsely called JUVENILE CARE OFFICES) AND THE EUROPEAN CONVENTION ON HUMAN RIGHTS. International symposium as a reaction to a judicial scandal in Bamberg: “Bamberg Declaration”: Within the framework of the child and youth protection in Germany, especially on the part of the youth welfare offices, there are violations of Human Rights, in particular of Article 3, Article 6, Article 8, Article 13 and Article 14 of the European Convention of Human Rights. CEED - Conseil Européen des Enfants du Divorce children and grandparents victims of international and administrative child abductions. http://problemamt.de/: Polnischer Verband Eltern gegen Diskriminierung der Kinder in Deutschland e. V.
www.rosanajoysugwayson.org: Rosana Joy Sug Wayson was abducted from her native Brazil Dec. 17, 1997, with the help of German officials. Related links. October 2006: Testimony of the "absolute power" of the Jugendamt, which is not corrected by other authorities. Der Fall Görgülü: Adoption durch staatlichen Kindesraub (Neue Juristischen Wochenzeitschrift NJW 2007 (2744): "Wenn der Rechtsstaat seine Unschuld verliert"). GEBT MIR MEIN KIND ZURÜCK: Wie leichtfertig einer Mutter das "Münschhausen-by-proxy-Syndrom" unterstellt wird, wenn ihr Kind an Borreliose leidet. CoE Press Release 499(2007). Report CommDH(2007)14 by the Commissioner for Human Rights, Thomas Hammarberg, on his visit to Germany, 9 – 11 and 15 – 20 October 2006: https://wcd.coe.int/ViewDoc.jsp?id=1162763: German Human Rights Institute should monitor, development of national action plan on human rights. 11 July 2007, CommDH(2007)14: REPORT BY THE COMMISSIONER FOR HUMAN RIGHTS MR THOMAS HAMMARBERG ON HIS VISIT TO GERMANY 9. – 11. and 15. – 20. October 2006: https://wcd.coe.int/ViewDoc.jsp?Ref=CommDH(2007)14&Language=lanEnglish Strengthen the mandate of the German Institute for Human Rights with regard to structural and factual monitoring, develop the national action plan on human rights. Freedom of Information (Access to Information Laws) in Europe and German states (länder).